Elite Dangerous Exploration Diary: Day 3 - Fuel concerns add to change of route. Bit of a delay for posting this, but I have been busy both writing my first short story, and catching up on a bit of the X-Files Series 2. I usually get to have a session online most days, but sometimes a short break can be beneficial. I am still in the Wredguia field of systems, but slowly working my way across it. There seems to be quite a few class T suns in this field which can make things a little awkward sometimes. My current system is one of those and the next jump is another T sun. After discovering all the bodies in the system, I have used up more fuel than I had wished. The original plan was to get away from the bubble as fast as possible, but not missing out on opportunities to make some exciting discoveries, so the routing algorithm was set to "Fastest Routes". So, as next star star system also has a T star and although the next following that has a scoop-able sun, it would leave me with I think about 25% to 35% of fuel left in the tank. So time for a little rethink. Changing the routing algorithm to "Economical Routes" has allowed me to keep the original way point, but include an M class star on the next jump, so I can breathe a sigh of relief. Having just started out, I have no wish to call out the Fuel Rats at this stage! 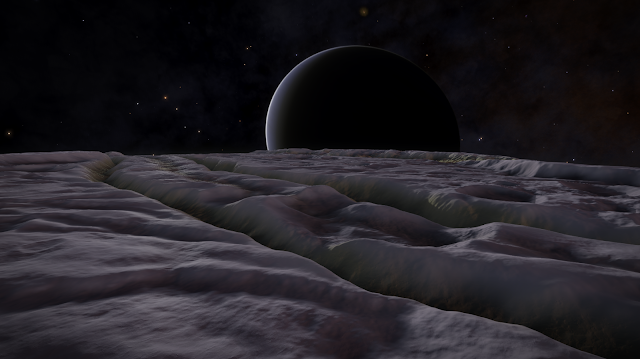 No worries though, this is what exploration is all about. Looking at the figures, it looks as if I haven't explored much, but in reality I have probably discovered more planetary bodies in the last 6 systems that have been explored, than all previous systems put together. I remember that of of these systems had just under 50 bodies that had not been discovered previously, so it was worth putting the time in. I have now reached my first way point, so a minor milestone. The total distance travelled so far is 1083 Ly, It hasn't taken as long as I first thought it would bearing in mind I have discovered a number of systems in the process. 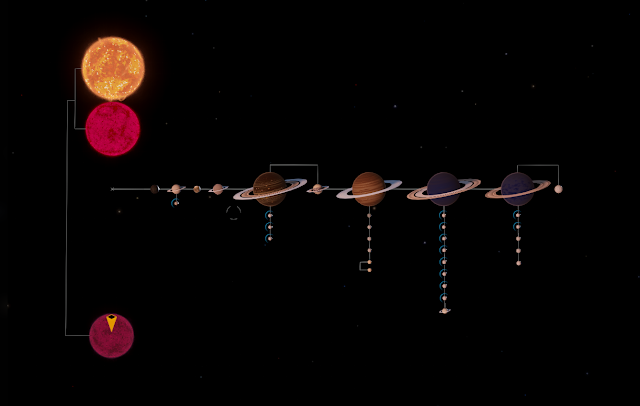 One thing that is worth mentioning here, is that a couple of jumps from reaching that way point, I came across a system that had been discovered. It had around 40 bodies and each and every body had a name tagged alongside it. It is good to see that another explorer has had the same idea as me on this route and spent some time checking out all the bodies and not just a few. Most of these systems have been normal, I use the word normal in as much as the system have 1 sun, with a number of planets orbiting that sun. But on occasions, as I am sure you too have discovered, there are a few systems that don't fit this normality. This is one such system. 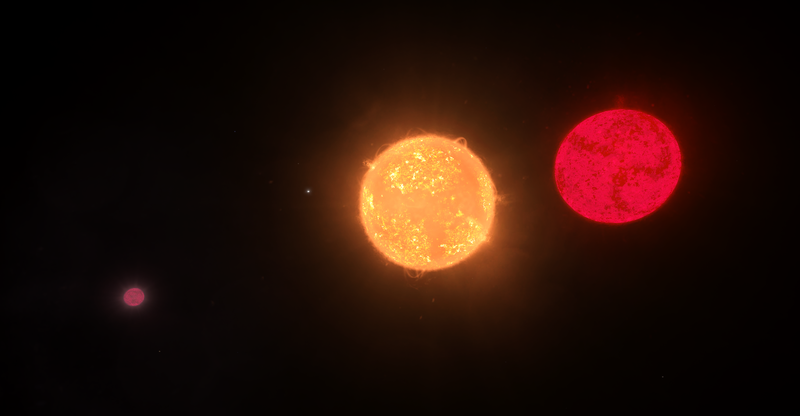 I had a bit of a surprise when I came out of super-cruise, I was slap bang in between 2 suns that were in close proximity. 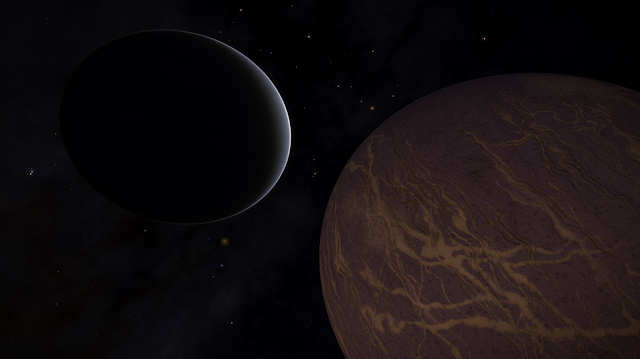 This is another one of those Jovian or class 1 gas giants. The descriptions says that the colouration comes from clouds in the upper atmosphere of ammonia, water vapour, hydrogen sulphide, phosphine and sulphur. Sounds quite a toxic mixture. 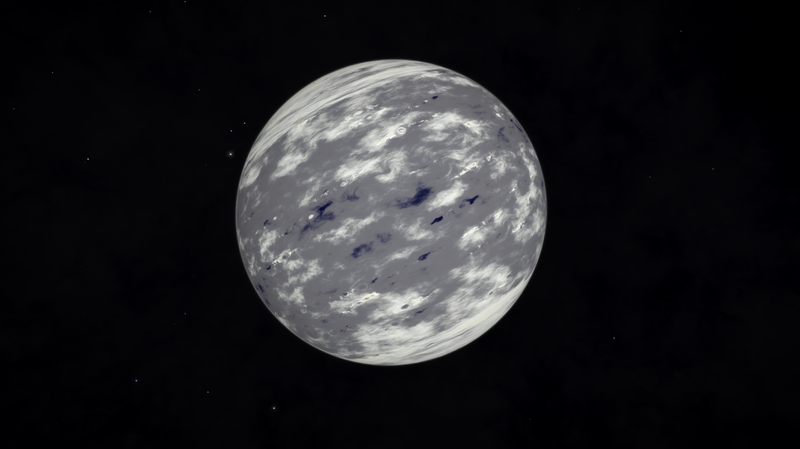 This is not what I would call a huge giant, it has a mass of around 255 earth masses, For me, this is another pretty planet, and is well worth a picture. A couple more snapshots of of this short travelling session. Perhaps not as outstanding as other pictures that I have seen on the web, but these I like, and as mentioned before, I do like the some of the more mundane places.